Our coffee blends come from a selection of direct trade and Rainforest alliance farms. Roasted fresh each week for your enjoyment. We visit farms all over the world and only buy coffee from farmers who hand pick every cherry when ripe ad who have a holistic approach to farming. Jake Lamotta was a famous Italian boxer and like this coffee, he packed a punch. This coffee is a typical Northern Italian coff ee. It has a full bodied, heavy mouthfeel, with flavours of dark stone fruits, salted caramel, dark chocolate and roast hazelnuts, with a lingering rich fi nish. It makes a strong americano and holds up well to give a dominant espresso flavour through milk based drinks. Guatemala, Honduras, Brazil, Papa New Guinea, and India. This coffee is smooth bodied with a light mouthfeel. The flavours will remind you of milk chocolate, toasted almonds and brown sugar with hints of acidity, red fruits, and an oaty biscuit fi nish. In the cup, Classic presents a soft but rich americano and holds up well to give a well balanced espresso fl avour through milk based drinks. This coffee is smooth and full bodied. The flavours will remind you of dark stewed fruits and short crust pastry with layers of rich chocolate to give a great mouthfeel and lingering fi nish. Kebele makes a soft but rich americano and holds up well to give a dominant espresso flavour through milk based drinks. 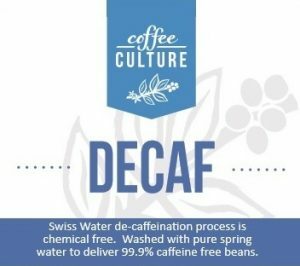 Swiss Water Decaffeinated Coffee uses pure spring water to create 99.9% caffeine-free beans, while maintaining the bean’s distinctive flavours and characteristics. No chemicals are used to remove the caffeine from the coffee. Talk to us about how we can help you to create a true artisan offering, that encompasses coffee, complimentary items and a customer oriented approach.